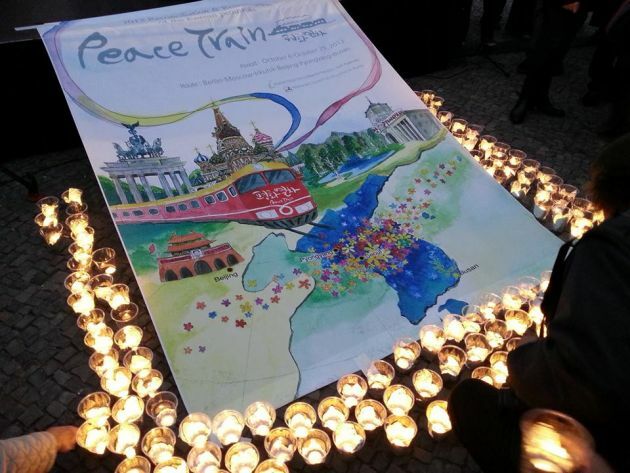 (Photo: Peace Train Facebook page Christoph Breit)Candles at Brandenburg Gate on October 7, 2013. Moscow residents have witnessed the Peace Train on which a band of Christians are on a remarkable journey across Europe and Asia. The train left Berlin six days ago on October 6, its destination Busan, where the once every seven years World Council of Churches Assembly will be held. The gathering of the highest governing body of the church grouping representing some 560 million Christians starts in the southern Korean port city October 30. (Photo: Evangelical Lutheran Church in Bavaria)Rev. 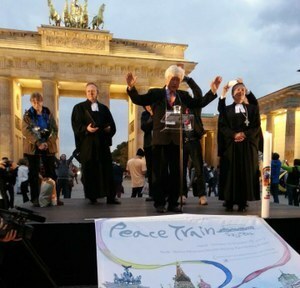 Kim Young Ju (center) gives the benediction at the Peace Candlelight Prayer Vigil in front of Brandenburg Gate in Berlin, Germany on October 6, 2013 before the departure of the Peace Train to Korea. In Busan thousands of participants will discuss many matters affecting the worldwide Church until November 8. In 2013 there is not only the 10th WCC Assembly in Busan; it is also the 60th anniversary of the armistice agreement of the Korean War, marking 60 years of division between North and South Korea. When Germans demolished the Berlin Wall in 1989 and the iron curtain separating Soviet sphere countries from the world was rusting rapidly, apartheid was crumbling. East and western Germany are now united. The Soviet Union no longer exists and after the ending of apartheid in 1990, South Africa has a democratically elected government. But North and South Korea still remain divided and sporadic tensions around the unresolved Korean War impact the North Asian region. Whereas the United States has an influence with South Korea. Russia and more especially China exert some influence on North Korea, divisions that have lasted since the days of the Korean War. The distance between the North Korean and South Korean sides of the demarcation line (DMZ) near Panmunjom can be measured in a few meters. The Rev. Olav Fykse Tveit, general secretary of the World Council of Churches, noted how this masks decades of pain and sadness experienced by the Korean people. While visiting the North Korean side of the DMZ in September, Tveit said, "The pain of separation felt by Koreans on both sides of the border is hard to ignore and escape. They are a divided people, divided families, longing for peace and justice and to be reunited." This week in Berlin a candlelight service for peace in front of Berlin's iconic Brandenburg Gate along with a peace seminar were held before the train. 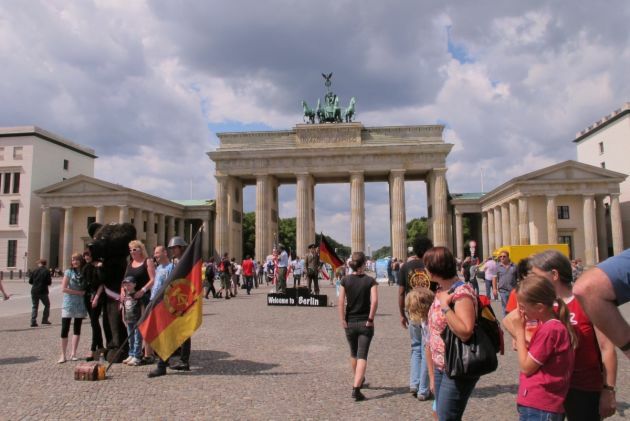 (Photo: Ecumenical News / Peter Kenny)Berlin's Brandenburg Gate photographed on July 30, 2012. Then the train snaked through eastern Germany and across the plains of Poland for 26 hours to Moscow on its mission of reconciliation and reunification of the divided Koreas where members of the Russian Orthodox Church met the travelers. In Moscow the head of the external church relations section of the Moscow Patriarchate of the Orthdox church, Metropolitan Hilarion of Volokolamsk said on Friday, "The Russian Orthodox Church is in constant collaboration and constructive dialogue with Government and civil society on issues related to the issues of justice and peace." He said the church's main priority is associated with prayer and spiritual activity. "But at the same time , the Church serves as a social force , the practical efforts of its diaconal services helping disadvantaged , as well as performing the works of peace , both at the regional level and in international relations," noted Hilarion. The train leaves Saturday for a journey across the world's biggest country for five days and four nights travel from Moscow to Irkutsk a junction city with almost 600,000 inhabitants in Siberia. Irkutsk boasts the Church of the Cross, built from 1747 to 1760 which is a considered a pinnacle of Siberian Baroque architecture. It also has the famous Epiphany Cathedral that was built between the years 1718 and 1746. As part of this Peace Project project, a seminar on Religious Communities for Justice and Peace was organized in Moscow, held on Friday in collaboration with the Russian Orthodox Church. Dr. Guillermo Kerber, the WCC programme executive on climate justice, and Dr. Mathews George Chunakara, director of the WCC's Commission of the Churches on International Affairs, addressed the seminar. Kerber said, "Being confronted by overwhelming crises, churches and religious communities must overcome their divisions, speak out and react as an expression of their commitment to life, peace, justice and love." Catherine Christie from the National Council of Churches in Korea and the Presbyterian Church in the Republic of Korea said that many people "suffer because of the corporate sin in our world – suffer from militarism, national hostilities. "This group, made up of people from some African nations, India, Korea, European nations, Australia, New Zealand, North America and Brazil," creates "a variety of perspectives and wisdom." In Berlin several programs were organized by German churches. One of these was the Peace Candlelight Prayer Vigil which took place in front of Brandenburg Gate on 7 October. Among the speakers were the Rev. Konrad Raiser, a former WCC general secretary and the Rev. Kim Young Ju, general secretary of National Council of Churches in Korea. The Peace Train website says, "Russia is one of the countries which has greatly affected the modern history of Korea. In the coming years, Russia could become a close partner for cooperation in the process of unification of the Korean peninsula." After Moscow and Irkutsk, the train will travel to Beijing, Pyongyang (if it is possible) and to Seoul. It will finally arrive in Busan around the beginning of the assembly on October 30. The Peace Train is a project of the National Council of Churches in Korea (NCCK) and the Korean Host Committee for the WCC assembly.